Played @kitchensOfIndia Contest on Twitter,And Luckily I Won!The Prize Was Their website Voucher Code worth Rs 400/- In Which I was allowed Select Any Item According To My Like! I went through their website,it had lots of contents like Including Veg and Non-Veg Masala Mix,Ready To Dine,Chutneys And Preservatives Etc. On the auspicious day Of Eid,I prepared Chicken Biryani Indulging Hyderabadi Chicken Biryani Masala Mix,The Masala is a kind of like Thick,Dry Chutney and smells pure and good!! When Added in the Chicken it gave a good Hyderabadi twist to it, I was easily able to Smell the aroma of spices (garam masala) + it gave a color to the Chicken and its thick biryani gravy!! The biryani was Amazing!!! This Hyderabadi Indulgence is quite good and fulfills one’s tastebud!! 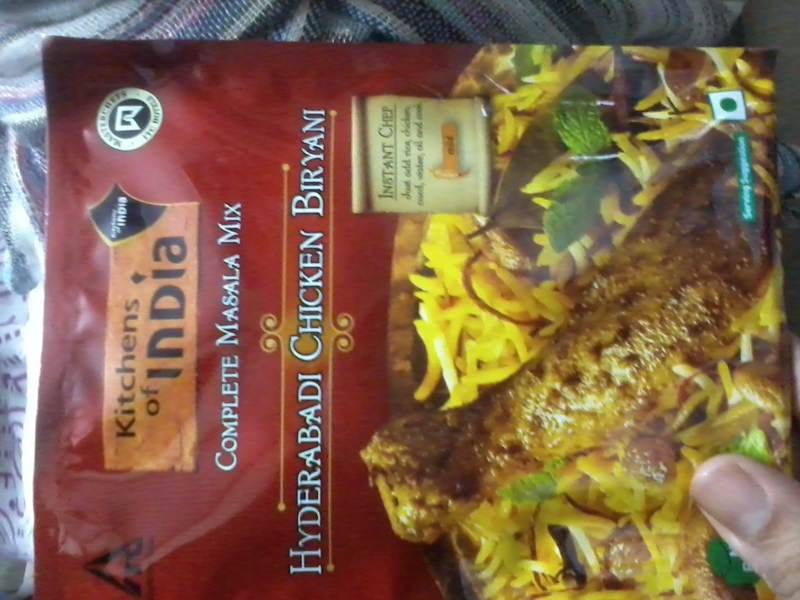 For Something Twist And Change In Taste Hyderabadi Chicken Biryani Masala Mix is Recommended! And The One Who are Vegetarian can involve in Vegetable Biryani Masala Mix!! This entry was posted in Uncategorized on July 30, 2014 by Samreen. When I Started Cooking,I Would love to get all kind of berries,but then I realised I have a special place for BLUEBERRIES in my heart,May be it was the summer,and they evoked memories around Jamun.There were loads of Jamun trees,down my compound garden!Although The Blueberry’s colour is similar to jamun,bt it doesn’t colour your tongue! I have been doing blueberry chutneys,preserves and jams and I also make a special chicken Tikka that is marinated with blueberry concentrate. Blueberry is a good way of adding natural flavour and colour to the food.Another fact is that you can serve them at any time of the year. You can freeze and defrost them whenever you wish to.Add them to your yoghurt,or even make great preserves by adding a little Sugar.So,BlueBerries inspires me to be creative__add a littlezing with a lemon or even chillies and make intresting +delicious preparations!!!! This entry was posted in Uncategorized on July 3, 2014 by Samreen.